Egyptian theming at Casino Lux. Runs on Grand Virtual software which includes a wide range of language options and some appealing and quirky graphics. They’ve got Las Vegas Money Wheel, a traditional wheel of fortune game but with some extra betting options. Play in dollars, euros or pounds. Please note: Casino Lux does not accept players who are located in the United States. 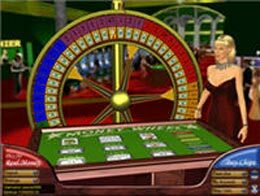 Casino Lux runs on Grand Virtual software so the game is called Las Vegas Money Wheel. The Grand Virtual game includes some classy 3D graphics. The Grand Virtual game offers traditional Wheel of Fortune plus a range of extra betting options and improved jackpots. The wheel is divided into 54 segments, with seven symbols and 6 colour regions. The house edge is from 11 – 22% depending on what bet you make. Average house edge overall 14.85%. The player’s best bet is on $1 segments. Casino Lux has download-only Grand Virtual software. You can opt for a wide range of language. English, French, German, Spanish, Chinese, Dutch, Greek, Italian, Japanese, Korean, Portuguese, Swedish, Norwegan, Danish, Hebrew languages available. New Player $50 FREE Gift. After installing the software, simply register, make your first deposit of at least $5, and they’ll add $50 in bonus chips to your player account. Monthly deposit bonuses: $25 when you deposit $100, and $25 random bonus awards when we looked. Customer support is via their online form or email. Dedicated multi-lingual support specialists covering 16 major languages. Casino Lux is owned by Everest Gaming Ltd. Licensed in Malta, European Union. Comments & Feedback on "Casino Lux Wheel of Fortune Review"